As part of Bluebell’s mission to take Daft as a Brush nationwide, we’re asking people at home, schools, academies, businesses and organisations to help plant 1,000,000 British Bluebell Bulbs throughout Great Britain and Ireland over the 2 year walk. Each bulb will represent a single cancer patient journey. Bluebell Bulbs are easy to plant, look amazing and are self seeding, they transform ourgardens in spring time. It’s not surprising that Bluebell is one of the nation’s best-loved wild flowers. Unlike Spanish Bluebells or Hybrid bulbs, our British Bluebells (Hyacinthoides non-scripta ) are grown in the UK, cultivated and supplied by Gee Tee – specialist bulb suppliers. But our native Bluebell is now under threat from an aggressive hybrid, many of the Bluebells found in our gardens and urban areas are not the traditional British flower: Read more from the BBC by clicking here. The BIG Bluebell Planting Plan! Pre-ordering is essential ideally, from now! To avoid disappointment, the sooner you order the better! 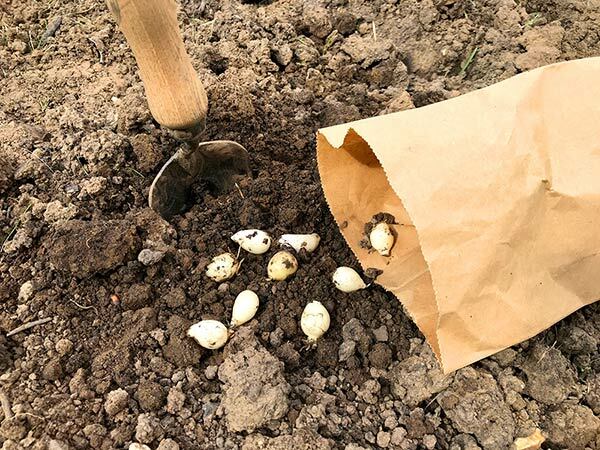 Bulbs will be ready from early August for delivery. Plant in the Autumn time. Bluebells thrive in partial shade, under trees or shrubs and need moist but well drained soil. Create your own miniature woodland! Bluebells flower between mid April and late May. Enjoy the spectacular blue hue and spring scent. Don’t forgot to send us a photo for our map! delivery up to 30kgs, is £6.00. All prices include VAT at the current rate. To buy securely on-line click the BUY NOW button above. Telephone orders can be made by calling Gee Tee Bulb Company – 01205 260 412. Please mention ‘Daft as a Brush’ so we can track the amounts sold. Payment can be made with debit or credit card over the phone. Gee Tee Bulb Company, Field Works, Common Road, Moulton Seas End, Spalding, Linconshire, PE12 6LF. If you prefer, please contact us to make an order. We will liaise with Gee Tee on your behalf and have the bulbs delivered to you directly. For schools, academies, business and larger orders please get in touch so we can administer the order for you to save you time! Thank you! Download a poster for your community hall, work palce, school or just for home! Download the poster by clicking here (A4 Size).